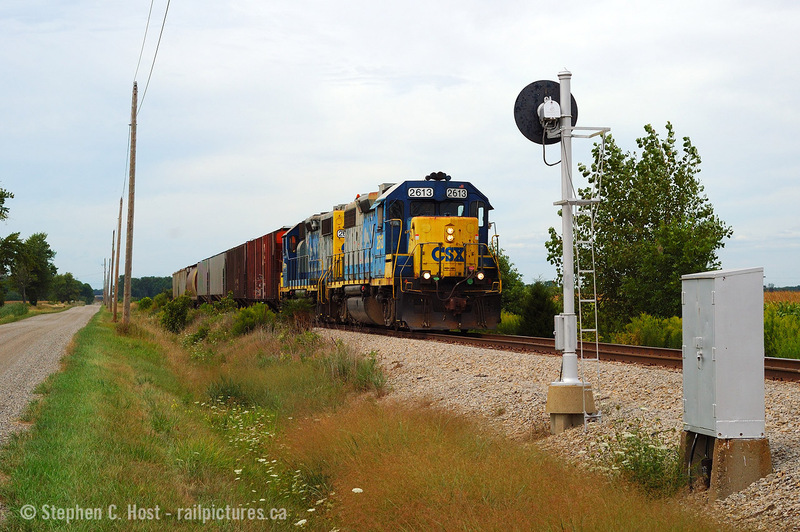 Railpictures.ca - Stephen C. Host Photo: D724 is southbound on the Sarnia Sub passing the approach signal to the Fargo diamond with the CASO Sub. 724 always ran in the mid to late afternoon so thank god it wasn’t sunny. Fans from this era would remember the detectors on the CSX Sarnia sub at mile 12, 33 and 51. Here’s a recording of this oddball, just north of this spot at mile 12: Here. For more recordings, including the RTC and Station Operator/Clerks (friendly Skip!) see this link here – photo of CSX D724 at Wallaceburg | Railpictures.ca – Canadian Railway Photography – photographie ferroviaire Canadienne. The NYC/C&O Fargo diamond was an Automatic interlocking for decades. You’d probably have to go back to the 1930s or 1940s to find the era when it was “manual”. That can be a discussion for another venue, but my guess would be NYC had the tower and provided the manpower. So sometime in the 1940s, perhaps early 1950s, it was automated. IE, first train into the outer circuit gets the routing. Naturally with NYC having much higher speeds, and much larger traffic volumes, their circuit was 5 times larger than C&O’s. So saying all that just to say this – even when some personnel were placed there in the 1990s, they handled paperwork for the train(s) and I guess the occasional train order. But they still had nothing to do with control of the interlocking. It would have remained automatic until the day the diamond was removed. Interesting – thank you for explaining the world of railroaders. Curious does this mean, when approaching Fargo the operator would clear the route for CSX trains upon your approach? I assume when they abolished the operator it became an RTC function and/or a push button to activate as it seems to have been when I saw it. These are Dash 2′s. The 2000s and 2100s that preceeded them were unrebuilt gp38′s. Dash 2s ride a little better, have upgraded cab seats, plus the APU ( little yellow beacon on the roof at the rear), meaning that I didn’t have ‘bar’ the engine over if it had been shutdown more than 8 hours…etc etc. Plus many of these had GPS for sending car reports to HQ. The speed limit in the early 1980s between Blenheim and Dresden was 40, except within yard limits and the city of Chatham, etc, interlockings . So at Fargo diamond, if you “felt lucky” (and lets face it, you could see for miles in any direction), you didn’t use a lot of air approaching the home signal. So maybe you’d go from 40 down to 35 after you passed the Approach signal (the one in this photo) and wait for about 8 seconds for the Home signal ( at the diamond) to go Green. Then release the air and put the throttle back in the kitchen. It was a little more stressful coming north because the roadbed is level. Of course when all else fails, you simply dump the air. But coming south, you were climbing a short sharp hill to reach the diamond, so you could afford to use less air because if you didn’t get a Green, you could ” set them down” fairly easy ( stop). cushy… What makes these units cushy compared to the other stuff found in the 80′s or 90′s ? I’ve also seen videos (W.D. Short work of Sarnia) of trains taking the Fargo diamond at quite the rate of speed… how would you describe speeds to Blenheim? in ’05 it was 25 MPH from Chatham to Fargo then slow to 10 for the rest of the journey, despite OCS control from Fargo to Blenheim. I’ve “knocked down” that signal a few hundred times…but not with this cushy domestic power.